Howard Garrick – Volunteer of the Year. Howard has devoted his time and energies to helping the homeless since he himself was able to change his own life from being on the streets. During the cold weather of February 2012 he set up an emergency shelter in a local Church and recruited local volunteers to run it. 69 rough sleepers and homeless people used the shelter. Robert Maclachlan and Jeff Edhouse were commended. Robert provides one to one support to children and young people at Angel Shed. He also sits on the Board as a Practitioner Representative. Jeff helps with caretaking and premises maintenance at Caxton House. He has been exceptionally reliable and willing to help including at Caxton House events and festivals. The Young Volunteer of the Year was Paul Grant. Paul decided to fill a gap in services by launching a supportive volunteering project to help people with disabilities and mental health concerns to take part in volunteering. He recruited a friend to help run the service and has promoted to the local community. Shannelle Rose who decided to open an activities club on the Highbury estate and helps run the scheme every Saturday morning was commended. The Older Volunteer of the Year was Kamalaben Tailor. Mrs Tailor has worked as a volunteer at Hanley Crouch Community Association for over 10 years. She runs the Weekender Project for older people based at the Community Association providing cooking, activities, home visiting and telephone contact. Pat Try who spent her working life as Coordinator of the Peel Day Centre and since her retirement in 1996 has helped out on a voluntary basis setting up Friends of the Peel to help with fundraising and events for the centre was commended. She is also involved in telephone befriending of older members of the Centre. Trustee of the Year was Damien Pocknell. He has been a trustee at Hillside Clubhouse for over 8 years. He is a passionate ambassador for the organisation. 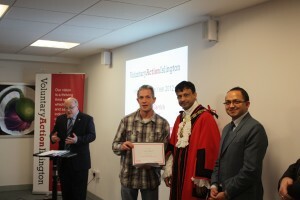 He helped Hillside to win a tender to provide services across Camden and Islington. He guided Hillside through the process of purchasing their building. He has been instrumental in the organisation having a bright future. Active Member of the Year was Olav Ernstzen. He became involved with the LINk when it was set up in 2008. Since April 2009 he has chaired the LINk and worked hard to ensure that it is open and inclusive, creating opportunities for new people to become involved. The Bridge School received the Volunteer Involving Organisation of the Year. They provide great induction and all the staff are really friendly.